ELMS: Tomothé Buret leads second Panis-Barthez Competition line-up. 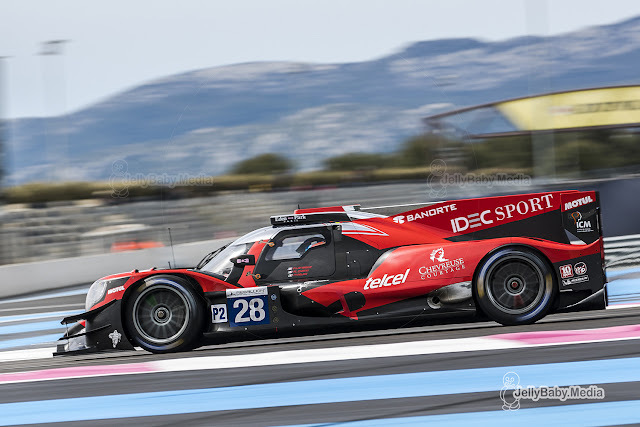 Following the previous Stevens/Canal/Binder line-up announcement for the Ligier JSP217 #23, Panis-Barthez Competition is now ready to run a two-car effort in the upcoming European Le Mans Series season. Aboard the additional sister car, the first official driver revealed is Timothé Buret, 23 years old, who is extending his career in LMP2 for a 4th consecutive season with Panis-Barthez Competition. The winner of the 2016 Jean Rondeau Prize is more than ever in a position to reap the benefits of continuity with troops of team principal Olivier Panis and team managers Sarah and Simon Abadie. Olivier Panis - Team Principal : "We - Simon, Sarah (Abadie) and I -, shared the common desire to carry on working with Timothé Buret. He has been with us since the team establishment whose initial aim was to find and develop young talents. Tim is the perfect illustration of our commitment. He has shown his determination, his team spirit and a host of skills on track. We are convinced he will emphasise his talent even more this year. He will play an important role among his new teammates by transmitting his experience and backgrounds with PBC." Timothé Buret - Ligier JS P217 #24 driver: "Finalizing my commitment in ELMS for another season was the absolute goal. I am happy that PBC, I consider as a second family, still had faith in me. 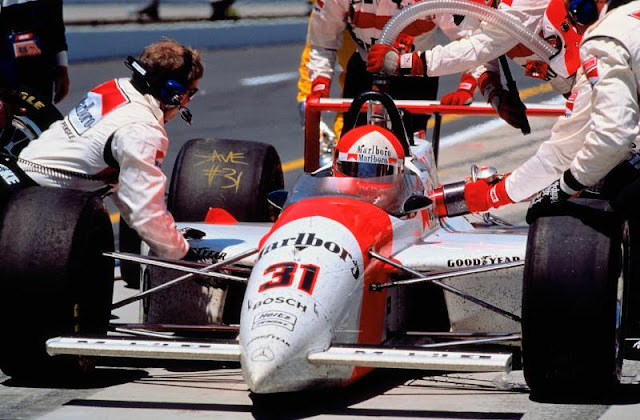 Driving with a team with whom I have already shared so much since my endurance debut is clearly a huge plus. Close to the sister car driven by Stevens/Canal/Binder, we will share all the data and push both of us close to the edge. I had an incredible complicity with Will (Stevens) and Julien (Canal) last year, and it will remain the same. From my side, I will do all I can to replicate the same relations with my new teammates." 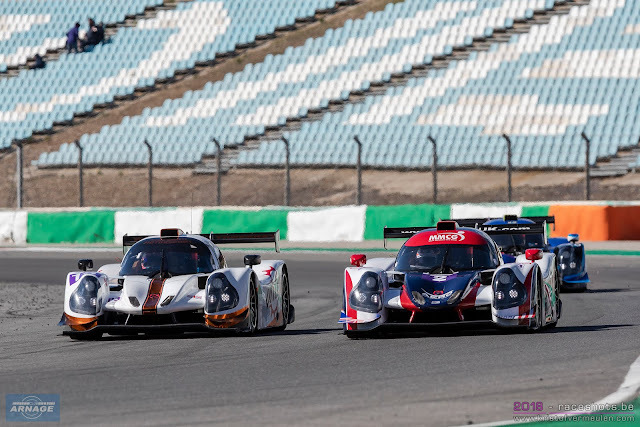 Algarve Pro Racing win the 4 Hours of Sepang and United Autosports win the 2018/19 Asian Le Mans Series! 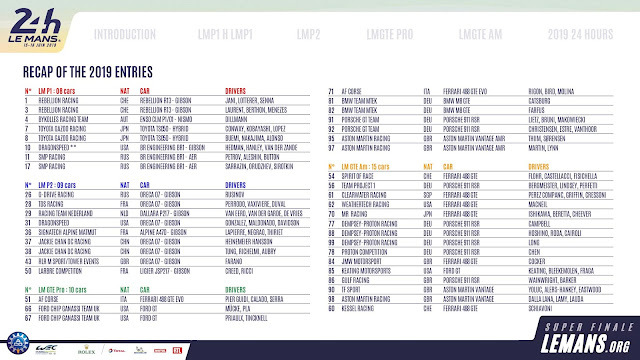 Le Mans entries for United Autosports, ARC Bratislava & Inter Europol Competition (LMP2) and Car Guy (LMGTE Am). 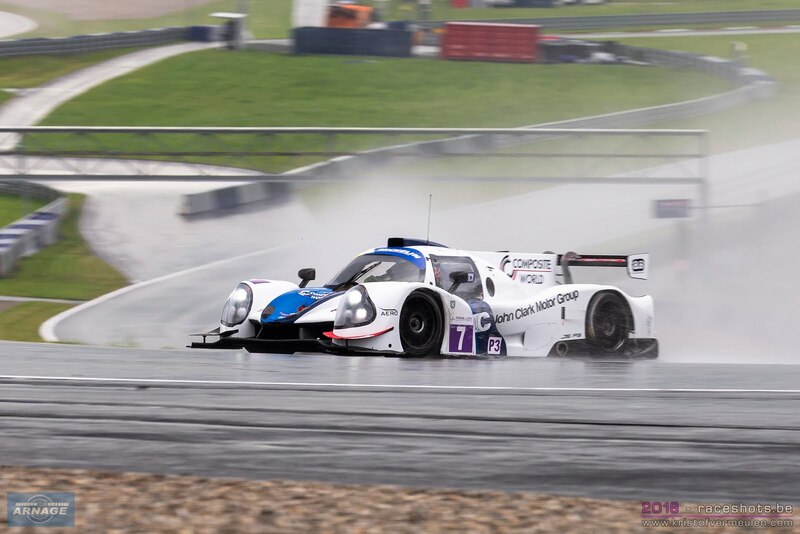 Second place in the 4 Hours of Sepang was good enough for the #22 United Autosports Ligier JS P2 Nissan of Phil Hanson and Paul De Resta to win the outright Championship in the 2018/19 Asian Le Mans Series. The #24 Algarve Pro Racing team of Andrea Pizzitola, Harrison Newey and Ate Dirk De Jong gave it their all, winning the race and finishing second in the Championship. In the LMP2 Am Trophy, ARC Bratislava finished 4thoverall and 1stin class in the 4 Hours of Sepang to claim the Championship win. Driving the ARC Bratislava entry were Miro Konopka, Ling Kang and Darren Burke. Their main title rivals, the #23 United Autosports Ligier JS P2 Nissan suffered a gear box problem that saw them retire from the race. The #25 Algarve Pro Racing entry also retired from the race, securing the championship for ARC Bratislava. 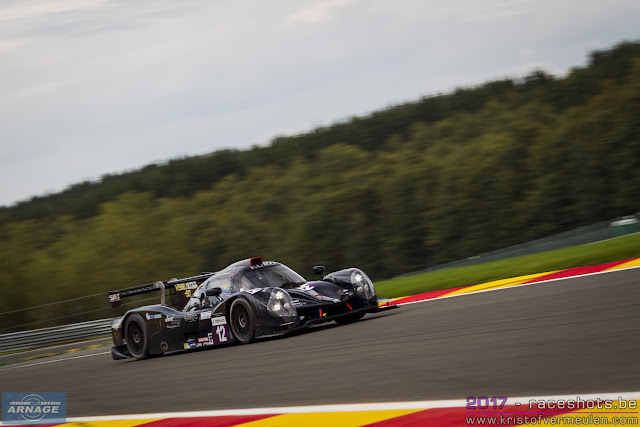 The fight for the LMP3 battle was intense throughout the race, but ultimately it was the #13 Inter Europol Competition Ligier JS P3 driven Jakub Smiechowski and Martin Hippe that won the race in dominant style to claim the LMP3 Championship title. 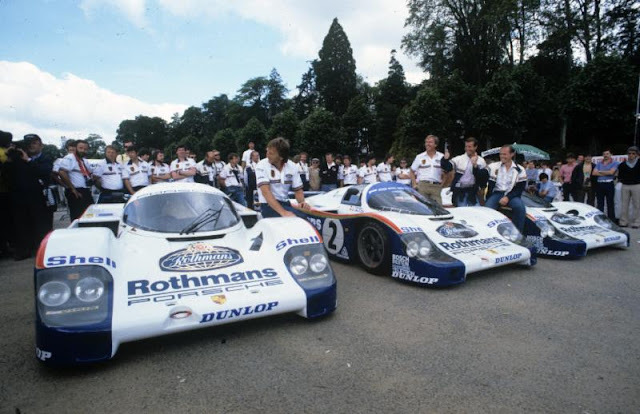 In 2ndplace was the #7 Ecurie Ecosse / Nielsen Racing Ligier JS P3 and third was the #2 United Autosports Ligier JS P3. Third place was good enough for the team to secure 2ndplace in the Championship for Chris Buncombe, Garett Grist and Wayne Boyd. In GT Japanese team Car Guy of Takeshi Kimura, Kei Cozzolino and James Calado capped off a fantastic season by making it four race wins from four starts in their #11 Ferrari 488 GT3 to win the GT Championship! It was not a simple exercise as they were forced to withstand significant pressure from the pole sitting #88 TianShi Racing Team Audi R8 LMS. The #88, raced by Xu Wei, Chen Wei An and Dries Vanthoor finished the race second and the #51 Ferrari of Alessandro Pier Guidi, Ozzy Negri Jr and Francesco Piovanetti finished 3rd, and claimed 2ndplace in the Championship. The GT Am title went to the second TianShi Racing Team Audi R8 LMS, the #66. Their race unfortunately finished in the garage with a DNF. On top of the added pressure of it being the Championship decider, the race was run in very high temperatures and humidity making for one of the toughest races of the season. This made the success of the winning teams all the more sweet. A trip to Australia, night racing in Malaysia, and a return to China and Thailand; that's the new Asian Le Mans Series calendar in a nutshell. The 4 hour race format will be kept for the upcoming season, but there's a few significant changes to look forward to next winter. The 2018/2019 season has been a great success so far for the series with a grid that has grown strongly in depth and quality, and a significant increased audience as well on track as online. 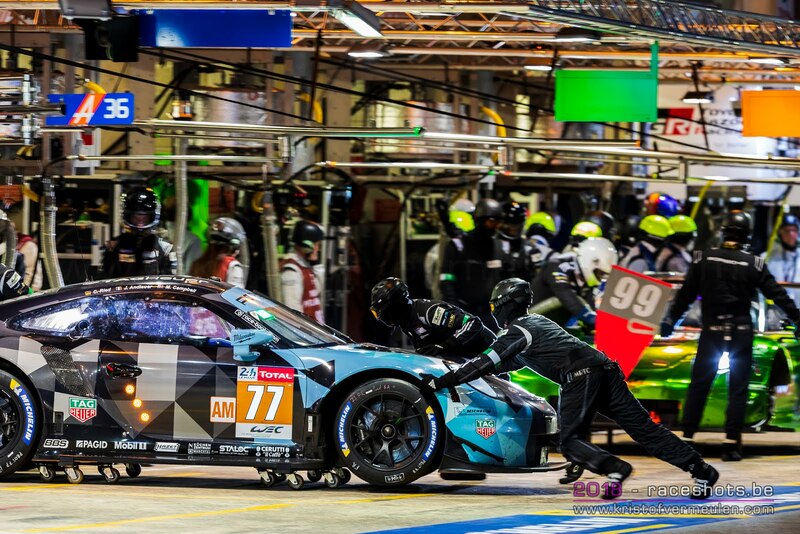 The Asian Le Mans Series is cementing its position not only in Asia, but now also globally. As from next season the current LMP2 prototypes will also be eligible to race in the series which might attract more (new) teams to the winter series. 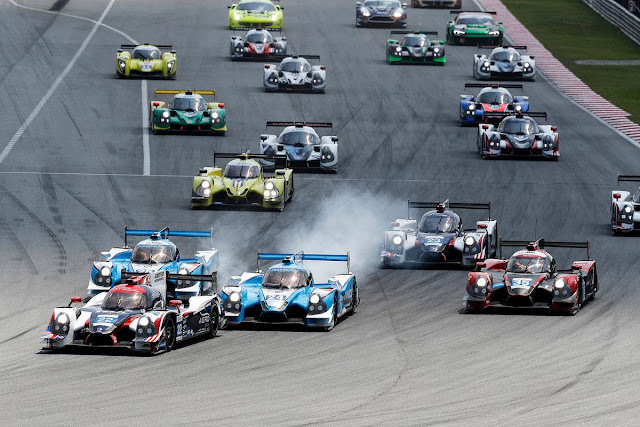 Just as it did this season, the 2019/20 Asian Le Mans Series will feature four races each of four hours in length, and will start in China again on the final weekend of November at the Shanghai International Circuit. The opening race will continue to be run in conjunction with the China Touring Car Championship (CTCC). 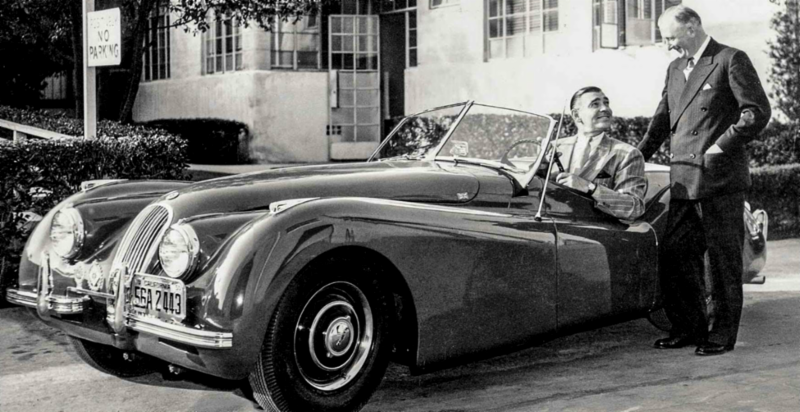 As previously announced, 2020 will see the Series’ first visit to Australia. 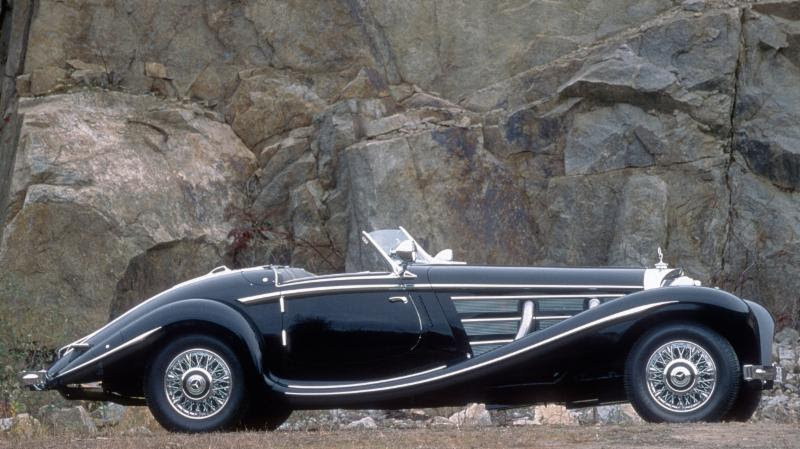 The second round of the Championship will be held on the 12th of January 2020 at The Bend. The Bend is Australia’s newest permanent circuit and is located approximately 100 km from Adelaide in South Australia. The Asian Le Mans Series will be the first series to use the full 7.77km configuration of the circuit, which is - apart from Le Mans - the longest track in any ACO supported series. In a change to their traditional season ending date, the third round of the Championship will be held at the Sepang International Circuit. The race will be held on Saturday the 15th February in 2020. Also new is that the 4 Hours of Sepang will finish into the night, with the second half of the race to be run after sunset. 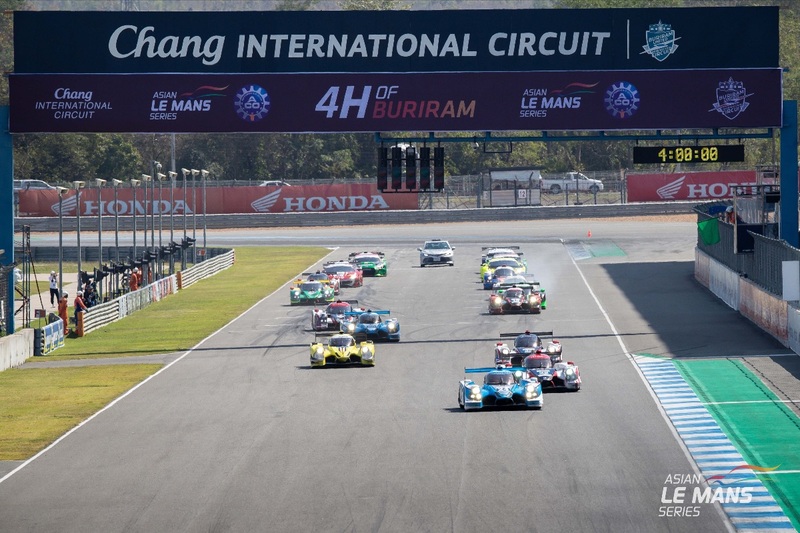 The final round of the 2019/20 Asian Le Mans Series will be held at the Buriram International Circuit on the 23rd of February 2020. Moving away from the traditional mid January date on Children's day, the Thai circuit will instead host the final 4 hour race of the Championship. The 2019/20 Asian Le Mans Series calendar has been designed to ensure it avoids clashes with other Asian series and major events in the region, whilst also allowing for transport times for those teams from around the world wishing join the Series. The opening round at the end of November now also gives (more) teams who race in the European Le Mans Series the time to prepare for the Asian series. 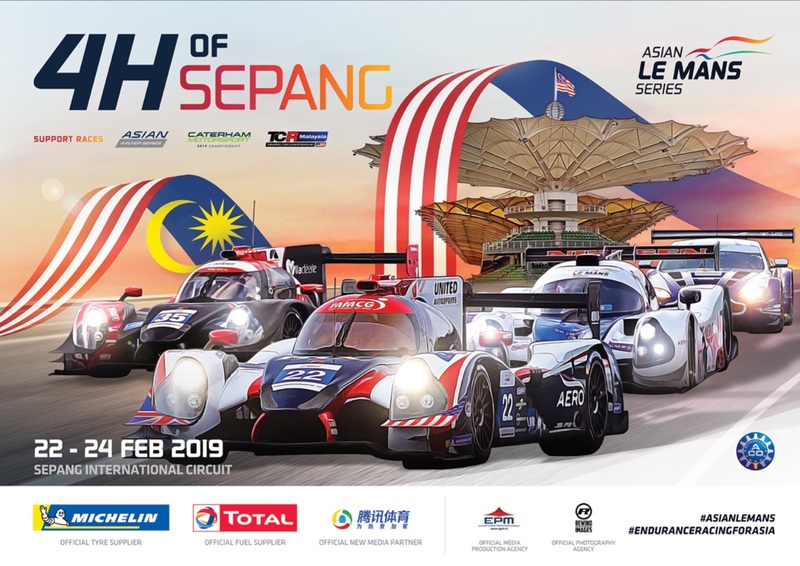 It's title showdown for the Asian Le Mans Series this weekend, with the final race of the 2018/2019 season to be held at the Sepang International Circuit. After a season full of close and exciting racing, all four championships are still up for grabs! 22 cars will be on the grid for the title deciding race in Malaysia on Sunday. 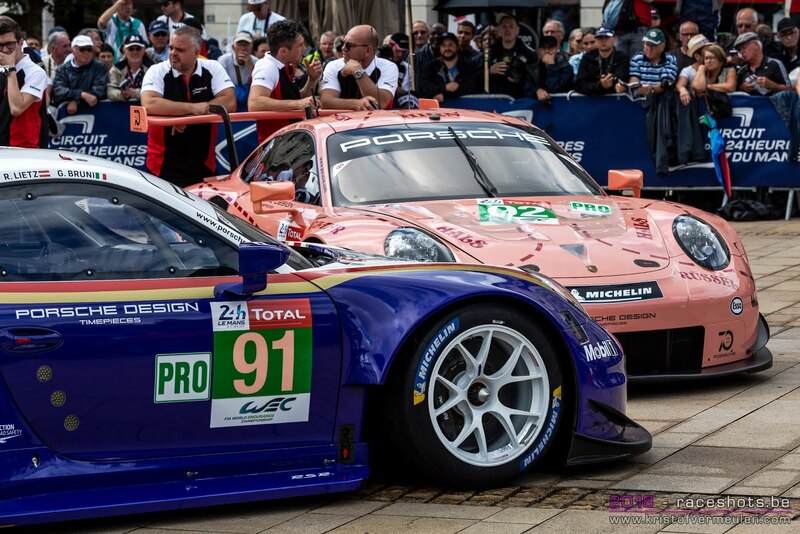 The final four invitations for the 24 Hours of Le Mans are also at stake this weekend. All class champions will reveive an invitation for the French classic in June; an invite for the LMP2 class for the champions in LMP2 and LMP3 and an invite for the LMGTE Am class for the GT3 champion. 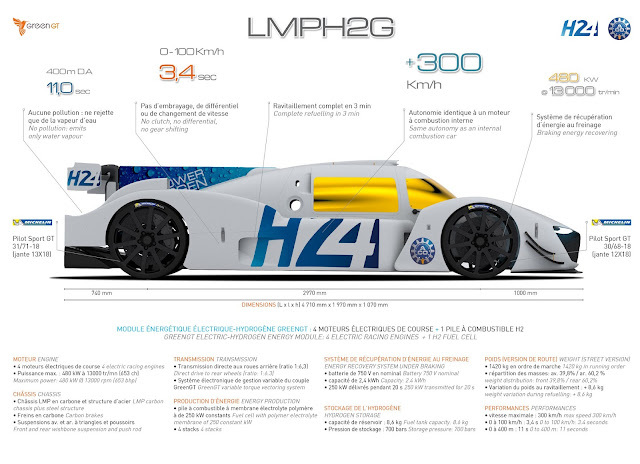 Additionally there will be an added recognition for the LMP2 amateur entries. They will also fight not only for the championship but for an extra invite to Le Mans. After missing the previous round in Thailand, the #8 Spirit of Race Ligier JS P2 will be back with Côme Ledogar, Alexander West, and Pipo Deranifor the 4 Hours of Sepang. While the #8 is expected to be fighting for the race win, the Championship battle is now down to just three teams, series debutants, United Autosports, 2016/17 Champions Algarve Pro Racing and ARC Bratislava. 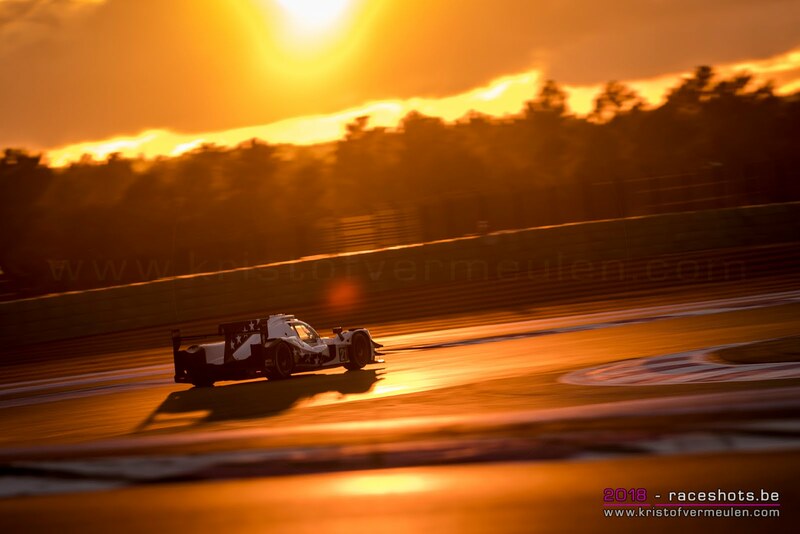 4 Hours of Buriram race winners, Phil Hanson and Paul di Resta in the United Autosports #22 Ligier JS P2 Nissanhold a commanding lead of 18 points in the 2018/19 season. Currently second are the 4 Hours of Fuji winners, Harrison Newey and Andrea Pizzitola in the #24 Algarve Pro Racing Ligier JS P2 Judd. For the final round they will again be joined by Ate Dirk De Jong. The #4 ARC Bratislava Ligier JS P2 Nissan being driven by Miro Konopka, Kang Ling and Darren Burke are also still in with a chance. To win, they must win the race, the #22 DNF, and the #24 finishes 2ndor worse. The ARC Bratislava #4 Ligier JS P2 Nissanalso comes into the final round of season with a 9-point lead in the LMP2 Am Trophy class. Their closest rivals are the #23 United Autosports Ligier JS P2 Nissan, Guy Cosmo, Patrick Byrne and Salih Yoluc who are 9 points behind them. 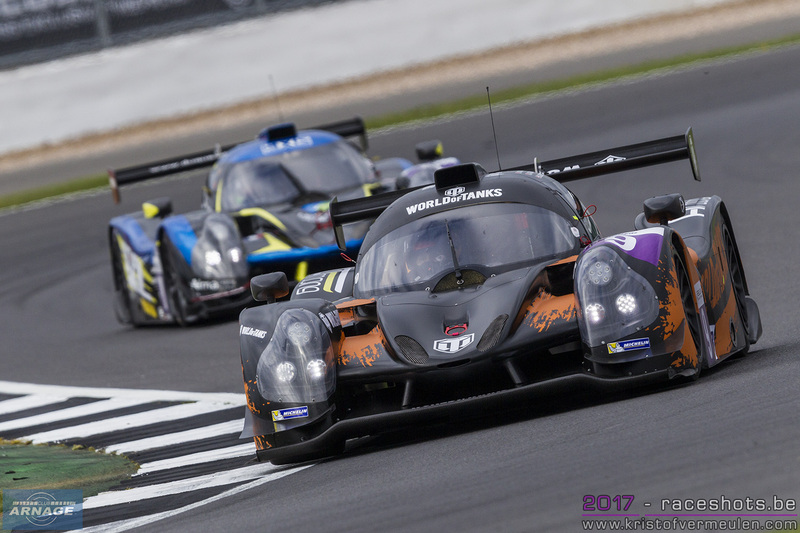 The LMP3 Championship has been intense this year and going into the final round there are four entire still in contention for the win. 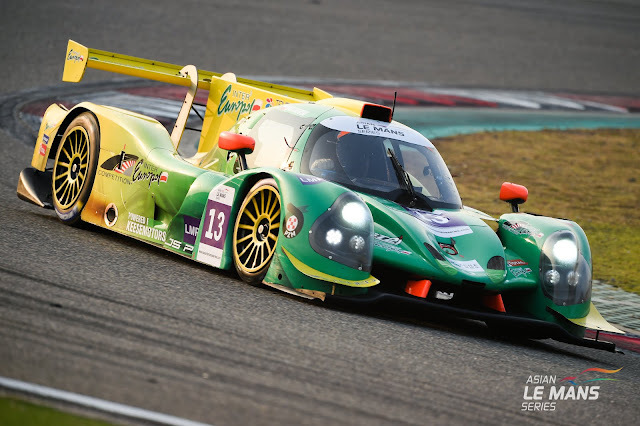 With a race win and two second place finishes the Class, LMP3 Championships leaders, Jakub Smiechowski and Martin Hippe inthe #13 Inter Europol Competition Ligier JS P3 have an 8-point lead. In second place is the United Autosports #2 Ligier JS P3 Nissan, driven by Chris Buncombe, Garett Grist and Wayne Boyd, and 9 points behind them is the sister United Autosports, Ligier JS P3 Nissan, the #3 driven by Matthew Bell, and Kay van Berlo. While it is a long shot, the #79 Ecurie Ecosse/Nielsen Racing Ligier JS P3 Nissanis 20 points behind the Class leaders. With 26 points on offer for pole and the race win, it is still possible. The 4 Hours of Sepang will see the welcome return of the #38 Jackie Chan DC Racing entry. Racing for the team will be Rick Yoon, Jake Parsons and James Winslow. As previously announced, the line-up of the R24 entry will feature Katherine Legge, Margot Laffite, and Michelle Gatting for the 4 Hours of Sepang. Series new comers, Japanese team Car Guy have dominated the GT class this season winning every race in the 2018/19 Season, with their #11 Ferrari 488 GT3. In the 4 Hours of Sepang, drivers Takeshi Kimura, Kei Cozzolino and James Calado will again come under intense pressure from the Spirit of Race Ferrari 488 GT3 being driven by Alessadro Pier Guidi, Ozzy Negri Jr and Francesco Piovanetti. The #51 can still win the Championship, but they must win and the #11 not score any points. Official Audi Sport driver Dries Vanthoor will return with the TianShi Racing Team (TSRT) in the #88 Audi R8 LMS GT3. He will be racing with Xu Wei and (David) Chen Wei An. Joining the #66 entry will be new driver Qi Peiwen (Aven) who has previously race in the teams SEAT TCR entry. He will join Zhang Yaqi (Dennis), and Max Wiser. 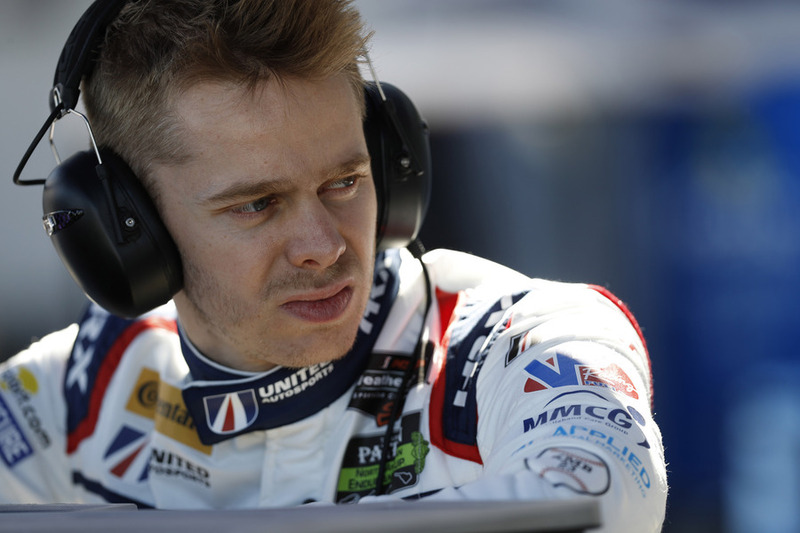 United Autosports has confirmed that Alex Brundle and Ryan Cullen will join their LMP2 team for the 2019 European Le Mans Series and pending entry confirmation, the Le Mans 24 Hours. Alex Brundle first raced for the team in 2016 when they made their European Le Mans Series debut. After scoring three wins and two further podiums, Alex was crowned 2016 ELMS LMP3 Champion alongside other LMP3 team returnees Mike Guasch and Christian England. Alex also joined the team for their Sebring 12 Hours debut last year, standing in for Bruno Senna and finishing fifth in the Ligier JS P217 with Phil Hanson and Paul Di Resta. Ryan Cullen is new to the team but has previously tested a Ligier JS P217 prior to joining them. Last year he raced in the European Le Mans Series for the APR – Rebellion Racing team and has previously raced in the Porsche Supercup and the GP3 Series. Most recently Ryan won the LMP2 class of the Rolex 24 At Daytona. Cullen has already totalled four days of testing with United Autosports, most recently attending their Barcelona pre-season test last week alongside Filipe Albuquerque and Phil Hanson. No less than 41 cars have been announced by the ACO for the 2019 European Le Mans Series, a championship that seems healthier than ever with this capacity grid. Lots of new faces, the addition of some very experienced and talented new drivers and several new teams in the championship set the bar high for what should be a very exciting 2019 ! 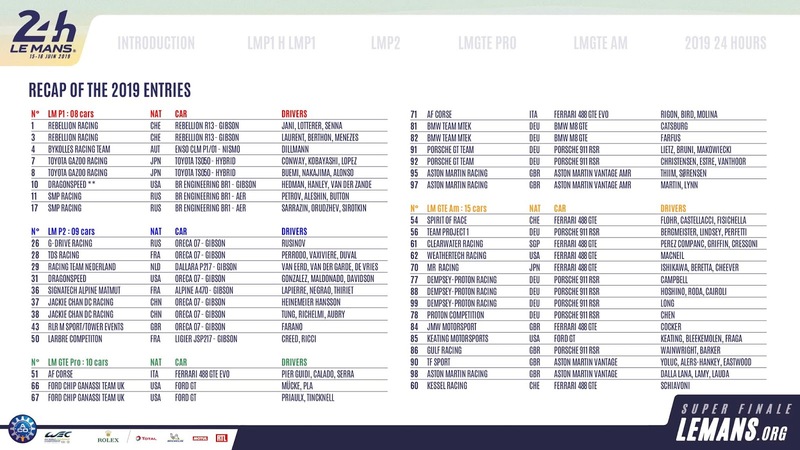 No less than 18 LMP2 cars feature on the list, a record amount of full season entries. We’ve already seen 18 (Monza, Red Bull Ring) and 19 (Le Castellet) LMP2 cars on the grid last season, but never before 18 LMP2’s have been committed to a full season entry. The LMGTE class also increases from 6 to 9 cars with the addition of 3 new teams in the class. 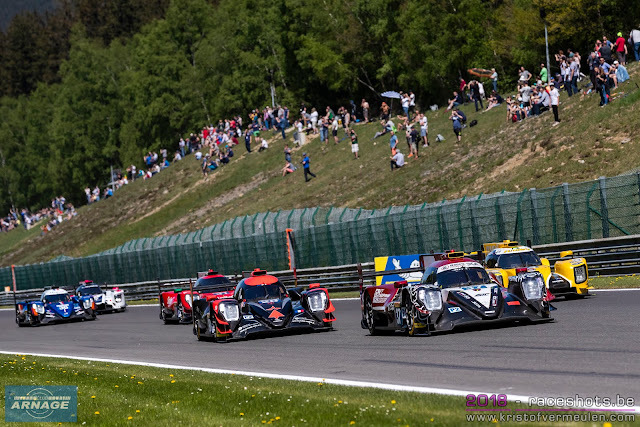 The addition of entries in both LMP2 and LMGTE has its effect on the LMP3 class, which loses a few entries and now has 14 cars. Less cars but several teams with a 2 car effort and what seems an increase in quality for this season. Last year’s champions G-Drive racing lead the LMP2 field with a single Oreca 07 for Roman Rusinov, Jean-Eric Vergne and LMP3 champion Job Van Uitert. No second entry this year for the Russian team which was run by Graff last year. 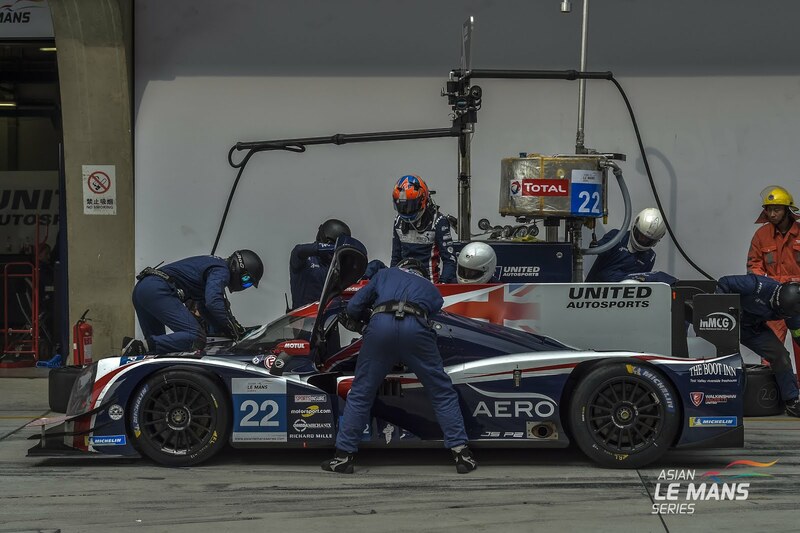 United Autosports return with 2 Ligier JSP217’s. The #22 will be driven by Phil Hanson and Filipe Albuquerque who also step up to the FIA WEC in the 2019/2020 season. The #32 has a new driver line-up with Alex Brundle who returns to team and Ryan Cullen. Algarve Pro Racing is also set for a two car effort again, although this season without support of Rebellion Racing on the second car. 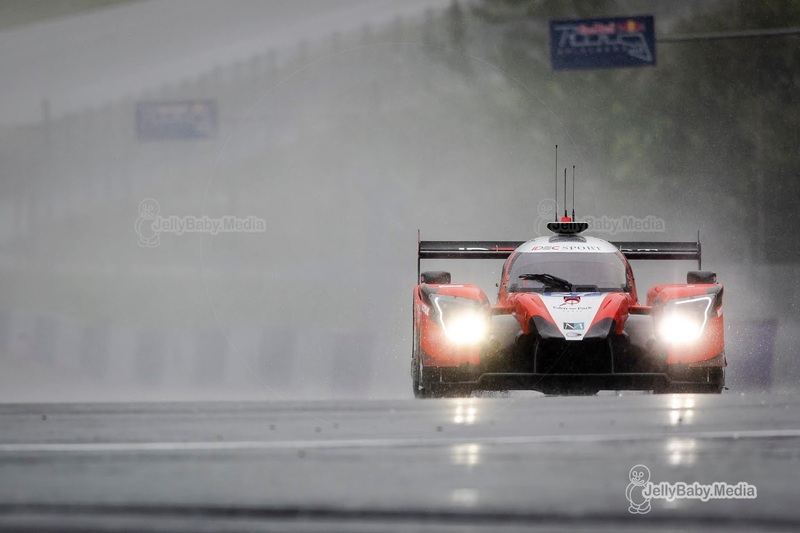 The Portuguese based team now fields 2 Oreca 07’s with 2 new driver line-ups. 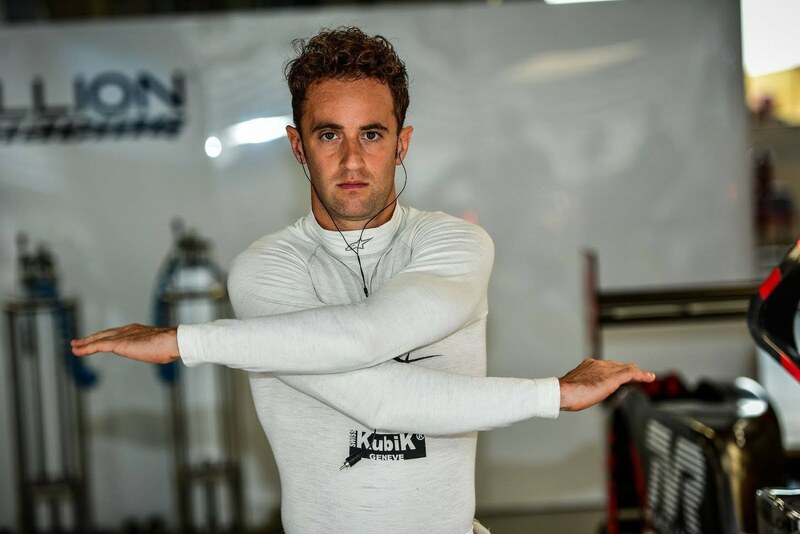 Mark Patterson returns to the #25 Oreca and will be joined by 2018 champion Andrea Pizzitola and John Falb, the 2017 LMP3 champion who will make his debut in the LMP2 class. The #31 Oreca has a promising line-up with young and talented drivers Henning Enqvist, James French and Tacksung Kim. IDEC Sport returns with 2 cars, an Oreca 07 and a Ligier JSP217. The trio of Oreca drivers (#28) remains unchanged with Paul Lafargue, Paul-Loup Chatin and Memo Rojas. In the #27 Ligier, Patrice Lafargue and Erik Maris will be joined by Stéphane Adler who has been racing in the French Porsche 911 Cup. The third team with a 2 car effort is Panis Barthez Compétition with the addition of a second Ligier. The crew of the #23 has already been announced with Rene Binder, Will Stevens and Julien Canal. Timothé Buret is the only driver confirmed in the #24 so far. Dragonspeed is back with the #21 Oreca. 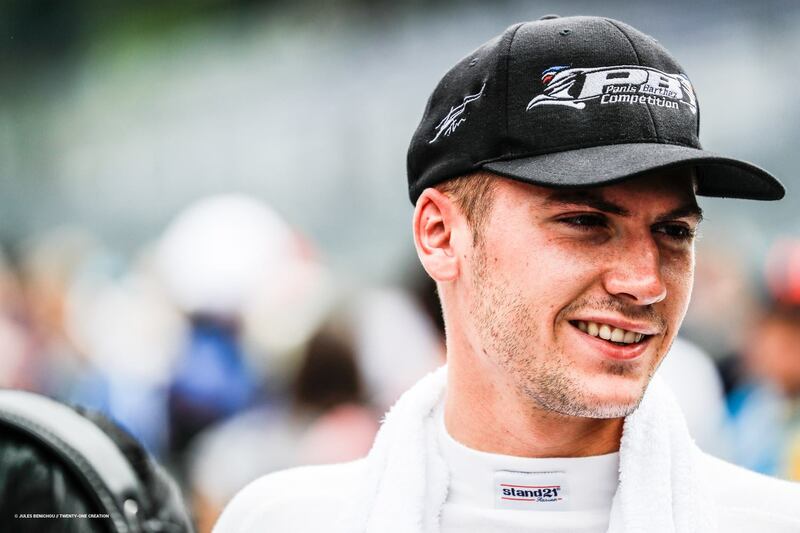 So far only Henrik Hedman has been confirmed as driver, it’s unclear if Ben Hanley will return for another season in ELMS with his debut in the Indycar series this year. Nicolas Lapierre won’t return to the team, switching to Cool Racing. 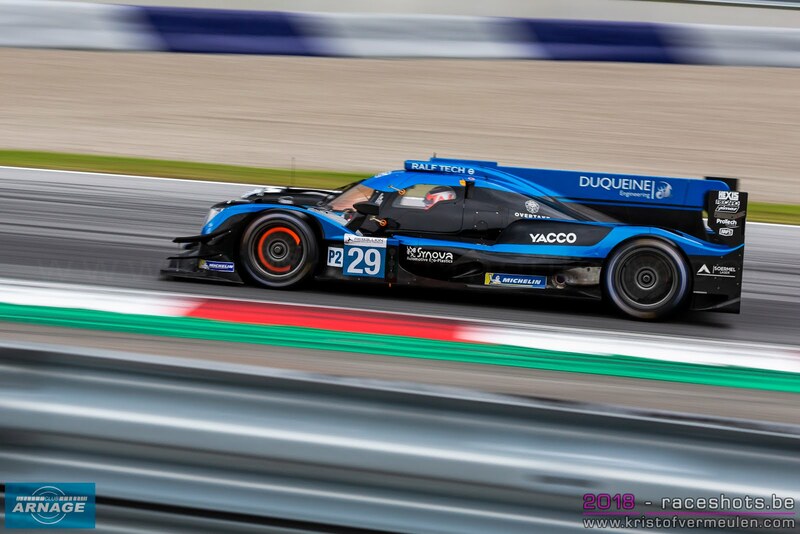 Duqueine Engineering is set for its second season in the ELMS top class with their Oreca 07. 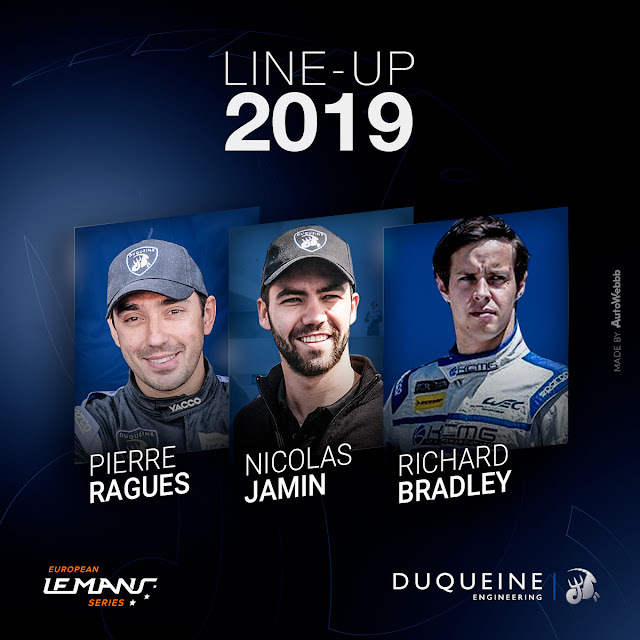 Pierre Ragues and Nicolas Jamin are still part of the team and will be joined by Richard Bradley in 2019. High Class Racing is set for its third season in the championship but changed from Dallara to an Oreca 07 during the winter. Anders Fjordbach and Dennis Andersen are expected to be back in the #20, and set for a debut at Le Mans, depending on confirmation by the ACO. 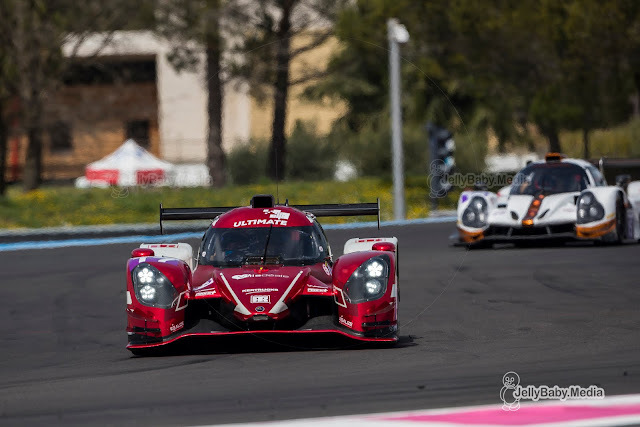 Graff Racing are also back in the LMP2 class but down to one car after running the second G-Drive car back in 2018. No change in the driver line-up for the French team with Alexandre Cougnaud, Jonathan Hirschi and Tristan Gommendy. 4 teams are moving up the endurance ladder, and are set to make their debut in the LMP2 class, some of them with highly rated drivers. 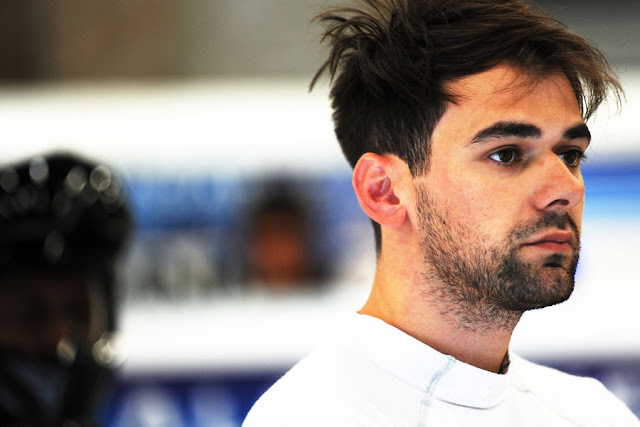 Cool Racing were one of the first to announce their intentions at the end of last season, and immediately announced Nicolas Lapierre as their lead driver. The highly experienced Lapierre will be joined by Cool Racing’s regulars Alexandre Coigny and Antonin Borga in the #37 Oreca. 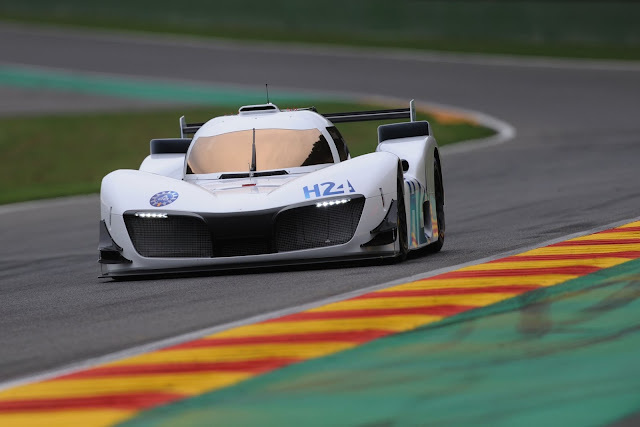 Inter Europol Competition is set for a busy season in the European Le Mans Series, entering not only both LMP3 cars, but for the first time also a Ligier JSP217 in the top class. Jakub Smiechowski has been announced as lead driver for the #34. Another big name to be seen in the paddock this year is Bruno Senna who has been signed by RLR MSport for their return to the LMP2 class. Senna will share the #43 Oreca with John Farano and Indian GP2 driver Arjun Maini. BHK Motorsport is a rather surprising addition to the class, moving up from LMP3 with a new Oreca 07. Francesco Dracone has been announced as lead driver, with Jacopo Barratto also expected at the wheel of the Oreca. The final team to enter this years championship is Carlin. A well known name and big player in the motorsport world in single seaters from F4 to Indycar who will field the single Dallara on the grid. A single driver has been confirmed so far: Jack Manchester who has previous experience in Radicals and the Blancpain GT Cup. A few teams from last season are missing on the list. Racing Engineering, who started the season with a win at Le Castellet last year and finished second in the championship decided not to return to the series. They have been testing at Barcelona in January with their Oreca, but seem to shift their focus to a new GT3 program. SMP Racing doesn’t return also, focussing on their LMP1 program in the World Endurance Championship, after already missing out the final 2 races of last season. Spanish team AVF by Adrian Valles also didn’t apply for an entry, after a fairly disappointing first season. Finally there’s Cetilar Villorba Corse who will race in the FIA WEC as from next season. The Italians will race their Dallara at Monza however, on a single race entry. 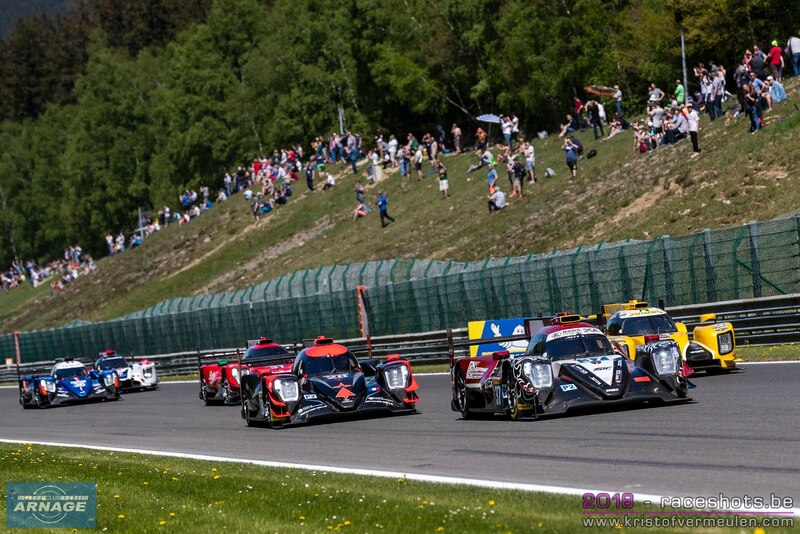 The growth of LMP2 and GTE has its reflection on the amount of entries in the LMP3 class this season. 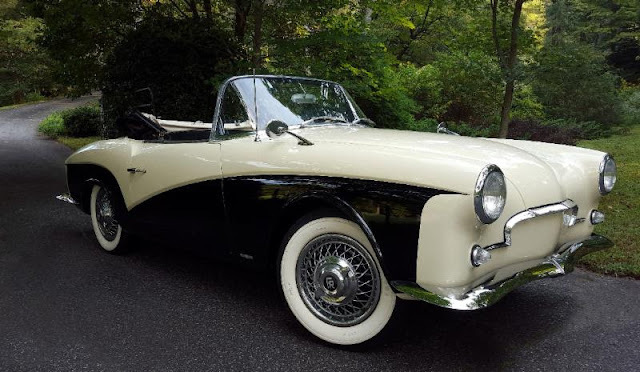 The class is down to 14 cars this year, compared to 18 last year. Less cars and also less teams in the paddock, since several teams have doubled up their efforts with a second car. Similar to last season, it’s a battle of Ligier (10 cars) vs Norma (4 cars). United Autosports is set for another 2 car entry with the #2 and #3 Ligiers. The #2 sees the return of 2016 LMP3 champions Mike Guasch and Christian England. In the #3 Canadian Garett Grist is the first confirmed driver so far. 360 Racing expands to a 2 car effort this season. James Dayson, who raced with Eurointernational last year, has been assigned to the #5 car, Terrence Woodward returns to his #6 Ligier. Another team doubling up is Nielsen Racing, who also races in the Asian Le Mans Series this winter, now adding a second Ligier to its garage. The #7 for Anthony Wells and Colin Noble, the #8 for Nobuya Yamanaka and James Littlejohn. The fourth and final team with 2 cars on the LMP3 grid is Inter Europol Competition. It’s going to a busy season, with a Ligier in LMP2 and two in LMP3 and the Asian LMS campaign. Martin Hippe (#13) and Paul Scheuschner (#14) are two familiar faces by now in the ELMS paddock. 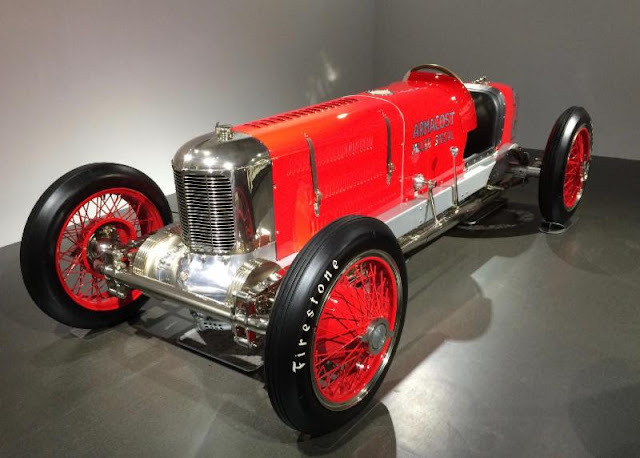 6 teams will have one car on the grid for the first race in April at Le Castellet. RLR MSport defends its title with a complete new line-up in the #15 (Rich/Olsen/Vedel). Swiss Realteam Racing is new with a Norma (#9), but will be run by Graff Racing don’t have any cars in class under their own banner. 2 drivers have been announced for Realteam: Esteban Garcia and David Droux. Also back is the colourful Norma of Oregon Team (#10) for Damiano Fiorivanti. The family-run Ultimate returns with its #17 Norma, which should be driven by Mathieu and Baptiste Lahaye and Francois Heriau again. Yvan Müller’s M.Racing enters just 1 Norma this season (#19), reserved for Laurent Millara and Lucas Légeret, the third driver still to be confirmed. Another team with 1 car less than last year is Eurointernational which now will have 1 Ligier at the start (#11) for Andrea Dromedari. Several teams who were expected do not appear on the list, meaning we’ll probably find them in the Michelin Le Mans Cup this year. DKR Engineering already announced they would focus on the MLMC again. Cetilar Racing was expected in the ELMS but apparently didn’t make the cut, as Spanish SPV Racing. Another ELMS regular from the past years which surprisingly isn’t on the list is Austrian AT Racing. Not only the LMP2 class increases in numbers, but - and this is a bit of a surprise - the LMGTE class also expands up to 9 cars. It’s a Porsche vs Ferrari battle again with the addition of a few new, but highly experienced teams in the mix the season. Last year’s champions Proton Competition are back with two Porsche 911 RSR’s. 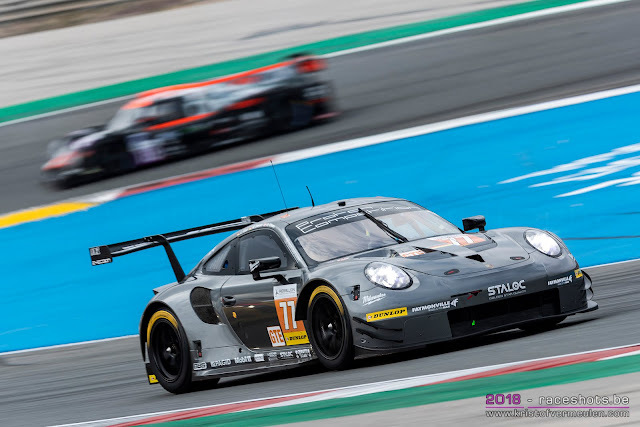 The #77 under the Dempsey-Proton Racing flag with Porsche factory driver Richard Lietz as designated driver and the #88 under Proton Competition for rising star Matteo Cairoli. 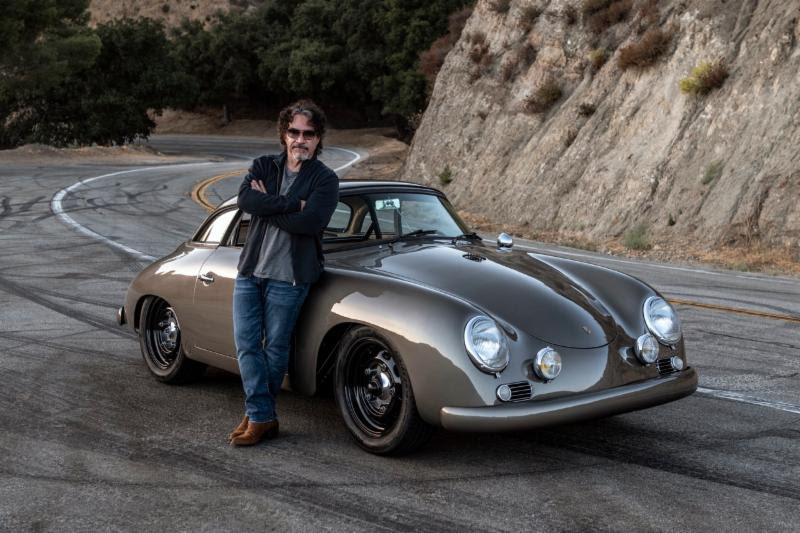 They will be joined by 2 other Porsche teams: the #80 Ebimotors of Fabio Babini, now and Project 1 with Egidio Perfetti. The German team expands its endurance program to the ELMS after a succesful start in their maiden season in the FIA WEC. 5 Ferrari’s will face the competition against the Porsches. Kessel Racing won last season’s GT3 class in the Michelin Le Mans Cup and steps up to the ELMS with a 2 car effort. The first Ferrari F488 GTE (#60) has been reserved for MLMC champion Claudio Schiavoni. The #83 will be the first ever full female driver line-up in the ELMS with Manuela Gostner, Rahel Frey and Michelle Gatting. 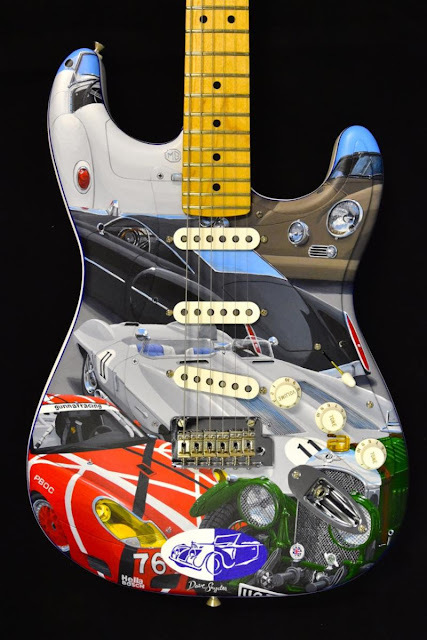 Another newcomer is Luzich Racing. A young team that debuted in the GT Open championship last season, and immediately won it with Mikkel Mac. No drivers have been appointed yet, but the return of Mikkel Mac to the ELMS wouldn’t be surprising. The 2 remaining Ferrari’s are familiar faces in the ELMS paddock with the #55 Spirit of Race of Duncan Cameron and the #66 JMW Ferrari who was runner-up last season. 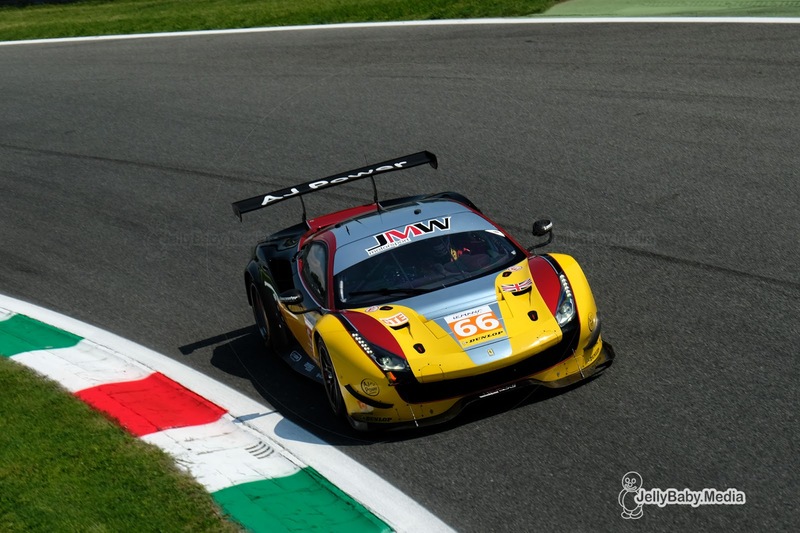 The designated driver for the #66 is American Jeff Segal who has been racing in the IMSA Weathertech and Pirelli World Challenge in the past years, raced at Le Mans with JMW last season and won the GTE Am class in 2016 with Scuderia Corsa. 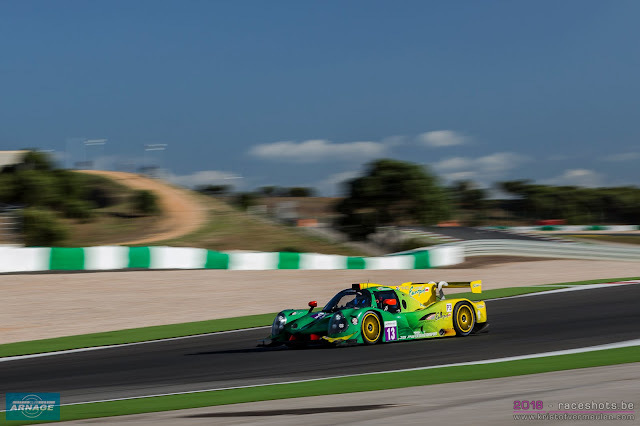 Just one team from 2018 is missing on this year’s entry list: the bright green Ferrari of Krohn Racing. 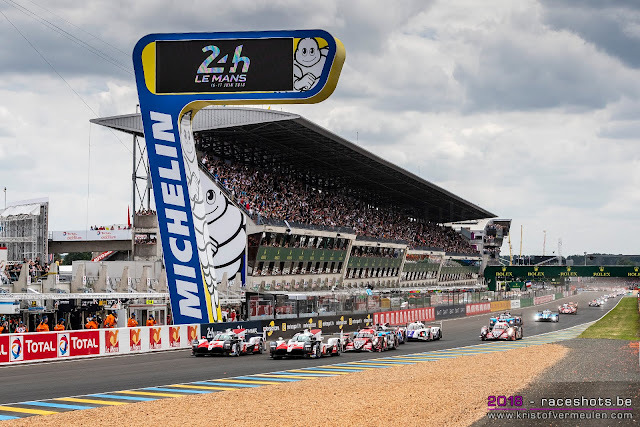 Le Mans: First 42 entries announced by the ACO. No Ginetta's in LMP1, Ford GT in GTE Am. The first 42 entries for the 24 Hours of Le Mans have been announced today by the Automobile Club de L’Ouest. Out of a total of 75 applications to participate at the classic endurance race and finale of the 2018/2019 FIA WEC Super Season, 60 teams will be invited for the race mid-June. 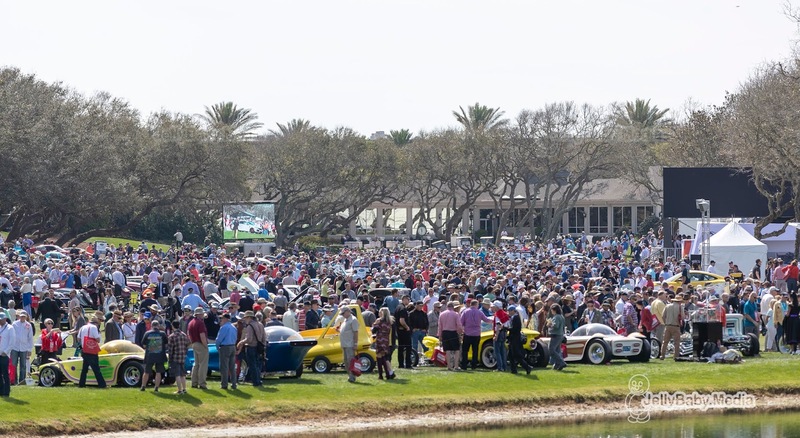 The next step is scheduled on March 1st with the release of the complete official entry list for the 87th running of the race. 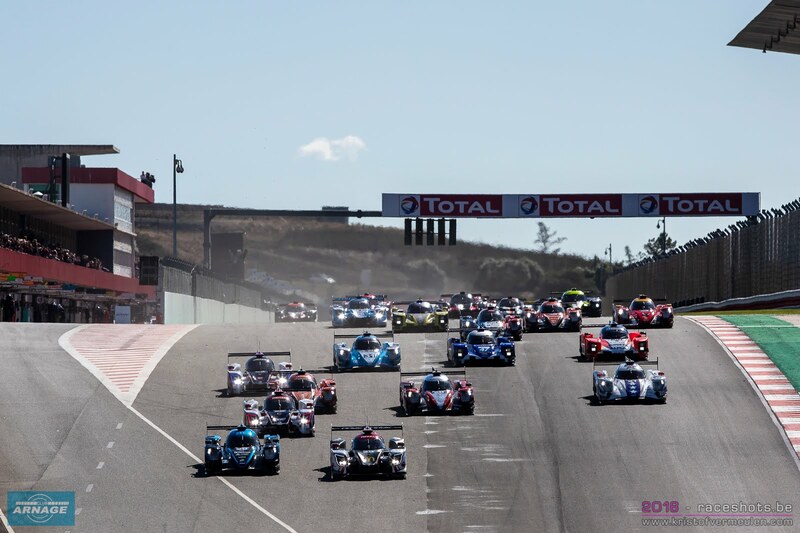 Despite earlier announcements which said 50 teams would be announced today and the remaining 10 plus 10 reserve teams on March 1st, the ACO decided only to confirm the teams racing in the FIA World Endurance Championship and auto-entries which have been taken up. The four invitations from the Asian Le Mans Series will be announced on 24 February after the final round in Sepang. This leaves "just" 14 entries to be assigned. Toyota doesn’t take up its third entry leaving both Toyota TS050 Hybrids from the FIA WEC at the start. They will be joined by Rebellion's R13’s, the Dragonspeed BR1, ByKolles and the 2 SMP Racing BR1’s. As announced earlier by the team, Nathanaël Berthon replaces Mathias Beche in the #3 Rebellion. Jenson Button will make his return to the #11 SMP Racing after missing out Sebring and Spa later this season. Ginetta has - unsurprisingly - disappeared from the entry list after failing to race in the FIA World Endurance Championship with the exception of Le Mans. It was already doubtable whether we would see the Ginetta LMP1’s on track since they only turned a few laps at the prologue and “raced” at Le Mans. Since then it all went quiet, except for an engine switch from Mecachrome to AER which hasn’t done much more than a straight line test, no on track testing at all. 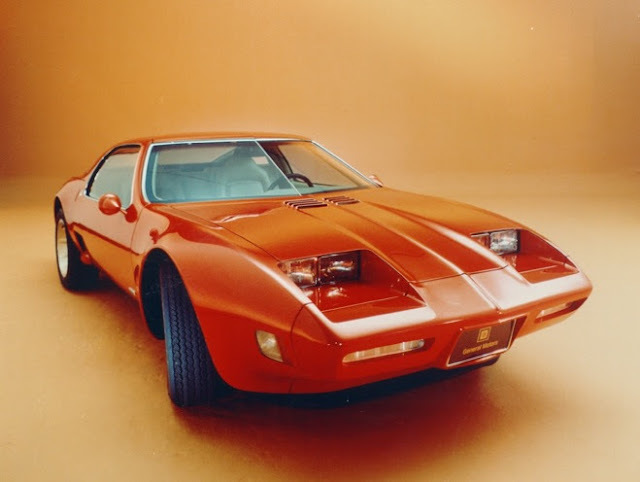 And although Ginetta claims to have their prototypes ready to race “whenever a customer” turns up, apparently nobody wants to make that investment. A good call thus by the ACO by leaving these 2 entries vacant at the moment. 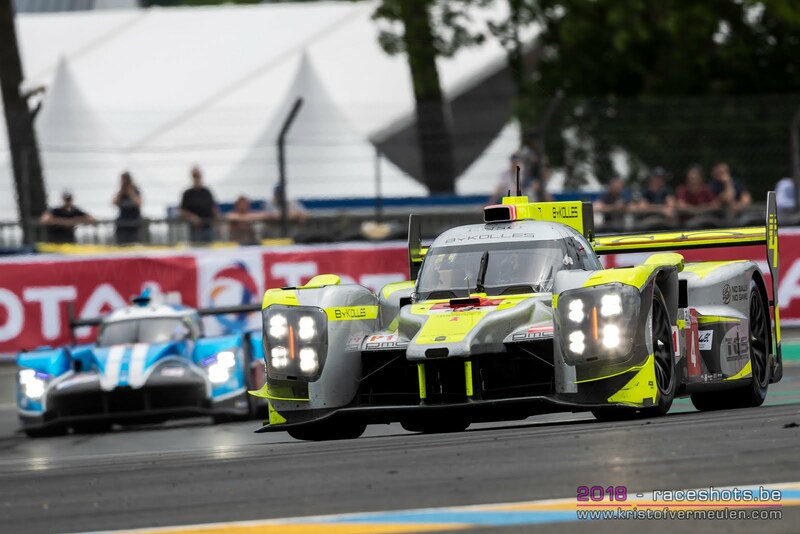 With just 18 entries left to be assigned, there will be more than enough teams who race in an ACO endorsed championship eagerly waiting for an invite for Le Mans. In the #26 G-Drive Racing Oreca, Roman Rusinov has been announced as the lead driver. 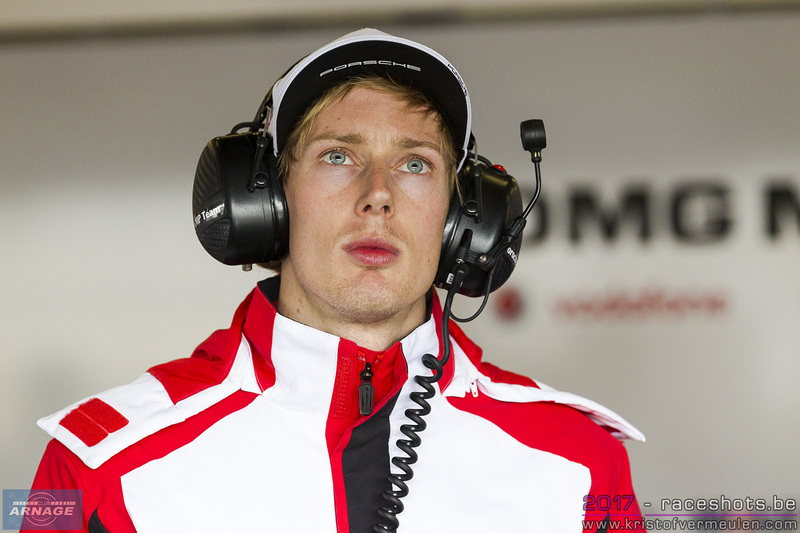 It seems likely though that he will be joined by ELMS drivers Job Van Uitert and Jean-Eric Vergne. 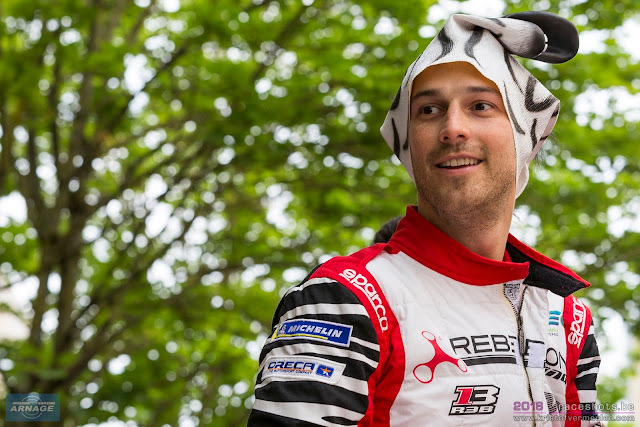 In the #37 Jackie Chan DC Racing - the former Malaysian backed LMP2 - only David Heinemeier Hansson has been confirmed. Other open seats are the third drivers for Larbre Competition (Creed/Ricci) and RLR M Sport/Tower Events (Farana/Maini), the latter in need for a replacement driver for Bruno Senna who is racing with Rebellion at Le Mans. ELMS runner-up JMW Motorsport returns to La Sarthe with his Ferrari and Jonny Cocker as designated driver. Swiss team Kessel Racing is set to make its Le Mans debut after winning the 2018 Michelin Le Mans Cup. 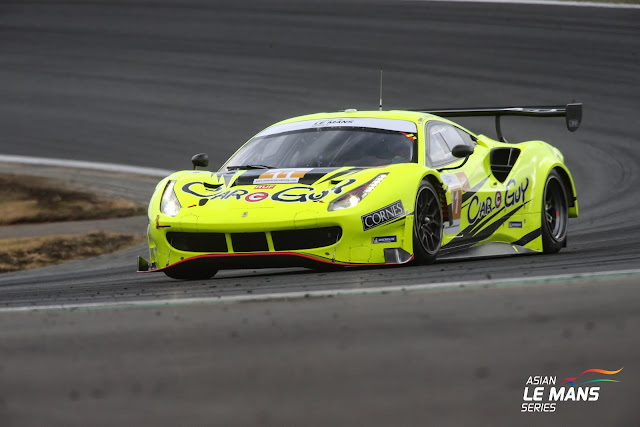 They will enter a Ferrari 488 GTE with Francesco Schiavoni as their lead driver. Another non-WEC entrant is the #62 Weathertech Racing Ferrari of Cooper Macneil. The biggest surprise is Keating Motorsport’s entry with the first Ford GT in the Am class. Ben Keating will be joined by Jeroen Bleekemolen and Felipe Fraga, the same line-up as with the Riley AMG in the IMSA championship. This will be Keating’s fifth Le Mans after 2 appearances in LMP2 (Oreca 03 and Riley) and GTE (Viper in 2015 and Ferrari last year). All other cars are the FIA WEC entrants. All driver line-ups for those entrants are complete except for the #86 Gulf Racing Porsche with one seat left next to Michael Wainwright and Ben Barker. IDEC Sport announced their 2019 racing plans yesterday, with their priority on the European Le Mans Series again. The French team of Patrice Lafargue will once again compete with two cars in the LMP2 class: an Oreca with a top grade line-up and a Ligier reserved for gentlemen drivers. While the main effort remains the ELMS, the pinnacle of the season will of course be the 87th edition of the Le Mans 24-Hour Race. Patrice Lafargue’s goal is to see both cars lining up at the start of the 24 hour race on 15th and 16th June, and to be sharing the enjoyment in Le Mans once again with his son, but this time with each of them in their own car. “IDEC SPORT got off to a humble start in the ELMS without registering for the Le Mans 24-Hour Race. We entered with one car in 2017 and got an excellent result. We stepped up our performance in 2018, once again with one car and I think that the ACO feels confident about IDEC SPORT. I think that should be noticed,” stressed Paul-Loup Chatin, the LMP2 driver in pole position in the 2018 Le Mans 24-Hour Race. Indian driver Arjun Maini joins Bruno Senna and John Farano in the RLR Msport Oreca 07 this season in the European Le Mans Series and the Le Mans 24 Hours. 21 year old Arjun Maini raced in the Formula 2 championship last season with Trident Racing. He finished 16th in the championship, his best results in Baku and Monaco with a fifth place finish. 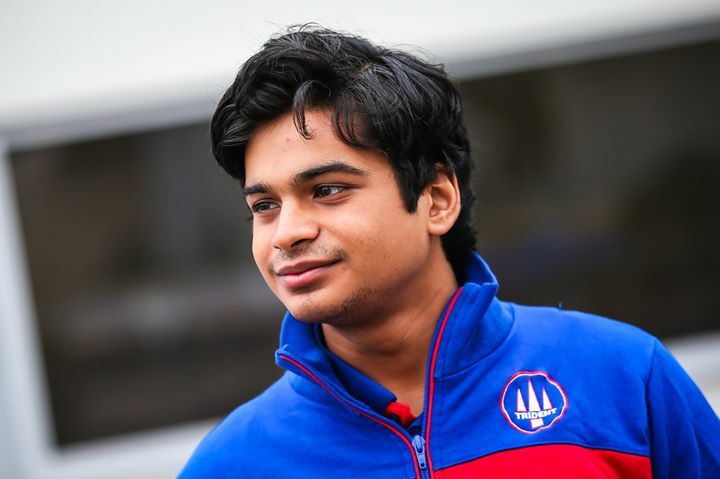 In 2017 he became the first Indian driver to win a race in the GP3 series in Barcelona. Since May 2017 he is also one of Haas F1 development drivers. Maini is now set to broaden his horizons and divert his attention from open-wheeled competition to endurance sportscar racing, as he will join RLR MSport for the 87th edition of the 24 Hours of Le Mans on 15-16 June and a full season in the European Le Mans Series (ELMS). He will share the RLR MSport-prepared ORECA with ex-F1 star Bruno Senna and Canadian gentleman racer John Farano in the European Le Mans Series, although other commitments will force Senna to relinquish his seat at Le Mans, and his replacement will be announced before the Automobile Club de l’Ouest reveals the 2019 entry on 11 February.